SunMaster Products, Inc. is proud to offer sun shade systems of the highest quality at affordable prices to all of Escondido. Our sun shade products include stationary and retractable awnings, canopies, interior and exterior solar screens, blackout shades, drop roll shades, sunroom shades, skylight shades, and patio cover shades. 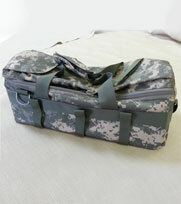 In addition, we also provide professional fabric die cutting and production sewing services. At SunMaster, we have a full service, state of the art sun shade system fabrication, fabric die cutting, and production sewing workshop onsite at our North San Diego facility, and do not outsource any of these manufacturing processes. For this reason, we can offer our exceptional quality products and services at very competitive prices, and are San Diego County's best value for sun shade system installation, fabric die cutting, and contract sewing services. At SunMaster, we are committed to providing personalized customer service to Escondido, and to all of our residential, commercial, industrial, and institutional customers, and have over 40 years of experience in doing just that. Since 1971, we have provided our superior quality sun shade systems and production sewing services to over twenty thousand satisfied customers throughout San Diego County and the surrounding areas, and are widely respected for our expertise and experience. 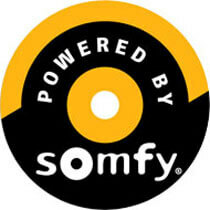 Call SunMaster Products today from Escondido. Our office hours are Monday through Friday from 8:30 AM to 4:00 PM. We accept Visa, Mastercard, Discover Card, and American Express. Sunmaster Products, Inc. is licensed, bonded, and insured. Since 1971, SunMaster Products has provided countless numbers of businesses and manufacturers with both low and high volume production sewing services. We can manufacture items such as backpacks, handbags, belts, harnesses, straps, and camera cases, and can even pack and ship these items for our Escondido clients upon project completion to any destination they specify. At SunMaster, our established reputation for providing exceptional quality workmanship at very affordable prices has made us the production sewing contractor of choice for countless businesses, manufacturing companies, product suppliers in the medical industry, and many military contractors. At SunMaster, we offer our retractable awnings in an extensive selection of fabric colors and types, and in either manual, crank-operated designs, or designs equipped with the latest motorized, automatic operating systems. Our exceptional quality retractable awnings come in a choice of framework metal types, and over 100 powdercoat color framework finish options. At SunMaster, our skilled craftsmen work closely with our valued clients to design the ideal retractable awning systems for their needs. Call us today from Escondido. Rely upon SunMaster to create the ideal stationary awning for your Escondido business, industrial, or institutional facility. At SunMaster, we can design any type of awning imaginable, including entry awnings and canopies, store sign awnings, and window awnings, complete with custom-designed valance detail. Our awnings are available in an extensive selection of fabric types and colors, including the full line of Sunbrella and Dickson fabrics, and in over 100 framework finish colors. 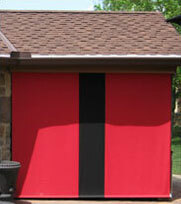 In addition, our awnings can be hand-painted with your business's name or logo. Call SunMaster today, and discover how our beautiful, superior quality awnings can add value and style to your Escondido commercial property. Depend upon SunMaster. At SunMaster, our stationary awnings and canopies are available in Sunbrella fabrics, and their extensive selection of fabric colors and patterns, all offered with their 10 year limited warranty – one of the best in the industry. 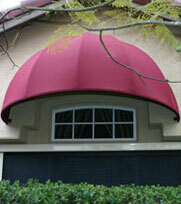 All awning and canopy framework is master-welded by licensed welders and is available in a choice of durable metal types and over 100 powdercoat finish colors, so we are certain to have a color which will coordinate perfectly with any awning fabric color and Escondido home or commercial building's exterior. In addition, our awnings and canopies can be custom-painted with your business's logo and name, hand-painted by a professional graphic artist in a durable fabric grade latex-based paint which is highly resistant to peeling and flaking, and will not fade over time. At SunMaster, each retractable patio cover shade we install in Escondido is custom-designed and fabricated for the specific home or business property where it will be utilized. Our retractable patio covers can be attached to both wood and aluminum patio covers, and are available in an extensive selection of fabric colors and types – both solid and open weave. In addition, they feature the innovative C.A.S. System™ – for the ultimate in ease of operation. At SunMaster, our highly skilled, experienced craftsmen pride themselves on adhering to only the highest standards of quality workmanship, and build our retractable awnings to be durable, and to function beautifully for years to come. 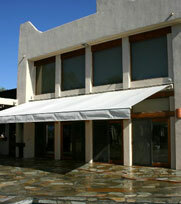 At SunMaster, our retractable awnings can be covered in an extensive selection of fabric types, colors, and densities, and all framework is available in a choice of over 100 powdercoat color finishes – with a shade available that is certain to complement any Escondido residential or commercial property's exterior. Trust the awning specialists at SunMaster to custom-design, hand-craft, and precision-install the ideal sunroom or skylight shade for your Escondido home or business. Sunrooms and skylights were invented to add natural light to residential and commercial spaces, but depending upon the time of day and the season, sometimes they can let in too much sunlight. At SunMaster, we can design and install shading systems for all types of sunrooms and skylights, and can do so at unbeatable prices. Call us today. At SunMaster, our awning recovering service can help to prolong the life of your existing Escondido home or business awning system. We can recover both fixed and retractable awnings, in a wide selection of fabric types and colors, and can also repowdercoat existing awning framework in a choice of over 100 powdercoat finish colors. In addition, we can also perform retractable awning repair, and can replace the lateral arms and operating systems on these awnings, for optimal functionality. Depend upon SunMaster for stylish drop roll curtains that are both durable and effective at providing maximal outdoor comfort for your family, guests, or business patrons. At SunMaster, our drop roll curtains can be attached to both wood or aluminum patio covers, and are ideal for keeping out heat, cold, and wind, as well as for providing privacy. They can be designed to operate either with a weight pipe or a side track operating system that allows the shade to be opened or closed at any position along the vertical drop – providing your Escondido home or business deck or patio with an "outdoor room" atmosphere. They are available in both manually-operated and motor-operated systems, and are offered in an extensive selection of fabrics, including Sunbrella fabrics, backed by a 10 year warranty. At SunMaster, we offer both our interior and exterior solar screens in a selection of fabric colors, and a choice of manually operated and motor operated systems. Our sun screens/solar screens are ideal for blocking the sun's heat and UV rays, and our blackout shades provide excellent room darkening. We offer top name brand solar screens, including: Twitchell Textiline, Phifer Suntex, and Sheerweave, and offer our exceptional quality sun screens with a 10 year warranty. Call us today for a free estimate in Escondido. 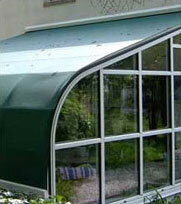 For superior sun shade systems at affordable prices, rely upon SunMaster. We service Escondido and all of San Diego County, and are licensed, bonded, and insured. Call us today to schedule a free onsite estimate.